OK, don't be too judgemental. Keep in mind that I am trying to recreate an amazing work of art on a teeny tiny canvas. You can get the idea though right? This is my depiction of The Scream by Edvard Munch. Acrylics on a black base. UHHHHMAZZZZINGGGGG! I think this is fab!! Nooooo!!! You are too good. Really. It's not fair that you are that talented!! Beautiful!! I love it! You did an amazing job on this manicure! Be proud, wave your fingers in peoples faces until they notice how cool you are! WOW!!! This is freaking awesome!!! good golly miss molly! this is WICKED! Holy flip! This is amazing! Wow! wow, i'm speechless, this is beyond awesome, thumbs up!!! This is fabulous! A great job of my favourite painting. 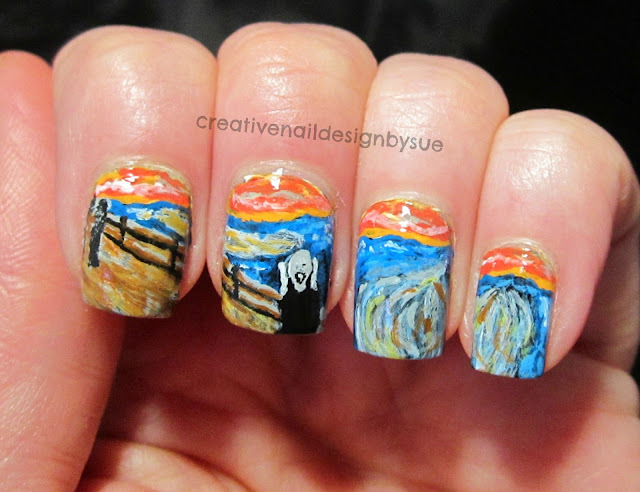 Your nails are a work of art!